My family came to visit for Memorial Day, and we had quite a cookout, despite threats of rain and storms. 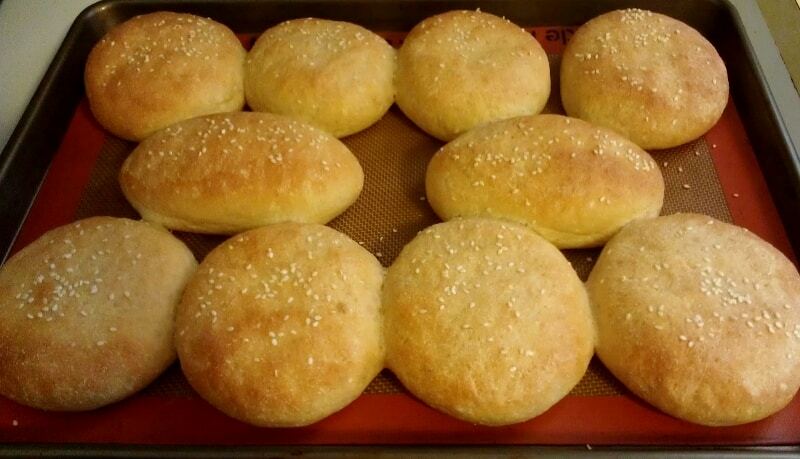 It was a great excuse to dive back into traditional baking and make some hamburger buns for Bread Week 22. I wanted a lot of them to pair with the lots of leftovers that we would inevitably have, so I decided to retry the King Arthur Flour buns recipe that I made as recipe #230 in 2010 for my 365 recipe challenge. I was just as happy with the results now as I was in 2014. This is a great hamburger or brat bun recipe if you want a serious bun to stand up to a hefty filling at toppings. This recipe, originally from King Arthur Flour, turned out great. The tops browned nicely, even without an egg wash, and the sesame seeds stayed in place. The buns were sturdy and had good, bready texture. They were soft but not squishy. 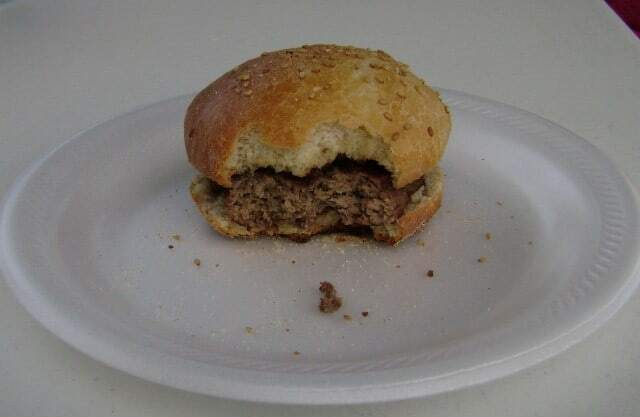 The buns had a nice flavor, with the whole wheat, but they didn’t overwhelm the burger or brat that you ate them with. They are, however, too large for hot dogs. They held up okay; the buns were a little crumbly after a few days, but weren’t stale. If you need to, you can stash the dough in the refrigerator between making the dough and shaping it. The first time I made these, I let the dough rise for 1 hour, then refrigerated it for a few hours (while I headed out of the house) before shaping buns. Bake as normal. This is a great, reliable bun recipe. It’s easy to make, doesn’t take too long to make overall, and yields enough buns for a crowd. It also happens to be easily made vegan. I’ll still try other bun recipes, but I think I’ll come back to this one again. Three Years Ago: Alton Brown’s Hot Tamales! Add additional flour if necessary, no more than 1/4 cup at a time, until dough pulls away from sides of the bowl. If dough is too stiff and already clears the sides but doesn't stick at the bottom, add a tiny bit of water to soften the dough. Beat the dough with the dough hook on medium-low for 5-10 minutes, until dough is elastic. Since this dough has whole wheat in it, it will not be entirely smooth. The dough should be somewhat stretchy and pass the windowpane test. Place dough in a greased bowl and cover with plastic wrap. You may have to reuse your stand mixer bowl for this. Let dough rise for about an hour, until dough has doubled in size. Divide dough into 18 pieces. The recipe suggests dividing the dough into thirds, then halves, then thirds. This worked well for me. I used a scale to ensure even portioning. Form dough into hamburger buns or brat buns. 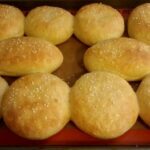 For hamburger buns, roll dough into balls, stretching the outside so it is smooth and tense. 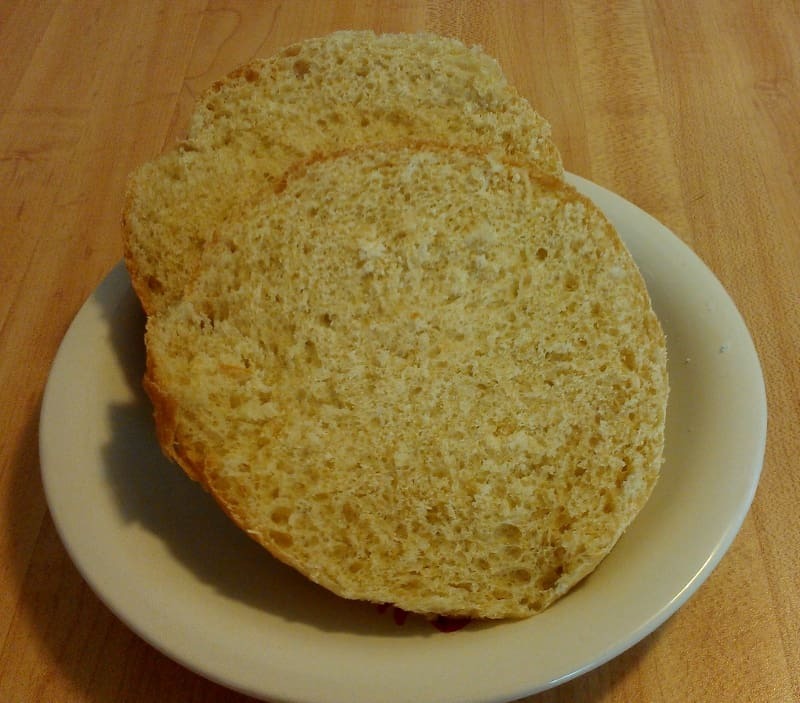 Flatten on a greased or lined baking sheet until the bun measures about 3 1/2 inches in diameter. For brat buns, form dough into a somewhat tight ball and flatten. Fold the bottom third up to the center. Fold the top third down to the center. Crease the seams together and roll dough back and forth a little to crease surface tension. Place seam-side down on baking sheet and flatten. Bun should be about 4 1/2 inches long. Place all buns 1/2 inch apart to have soft-sided buns that are attached to each other; place farther apart for separate buns. Cover baking sheets with plastic wrap and let rise for about 45 minutes, until dough has doubled again. Preheat oven to 400F. Mist buns with water and sprinkle with sesame seeds. (Original recipe called for an egg wash, which I skipped to make them vegan.) Bake for 16-20 minutes in the top and bottom thirds of the oven, rotating pans halfway through baking. Mine were done at 16. Cool before serving. I stored mine in a pan covered with foil for 3-4 days before we ate them all.